May 01, 2014, 8:52 a.m. When graffiti was found on some plywood in Bristol earlier this month, it was removed immediately. But the image wasn’t destroyed, as someone from the nearby Broad Plains Boys Club explained in a note: they had taken the plywood from the wall where it stood – and the painted image of a man and a woman embracing while checking their smartphones – to “prevent vandalism” and protect it from damage. After all the work of graffiti, or street art, was the work of “guerrilla artist” Banksy, and might be worth tens or even hundreds of thousands of pounds. The incident is yet another reminder of how far Banksy has come from the days when he found the inspiration for his signature stencilling technique while running from the police. The British public has also come a long way in their view of graffiti. A new YouGov poll reveals that by a resounding three-to-one margin (66% to 22%), people now think graffiti can be considered as "art". 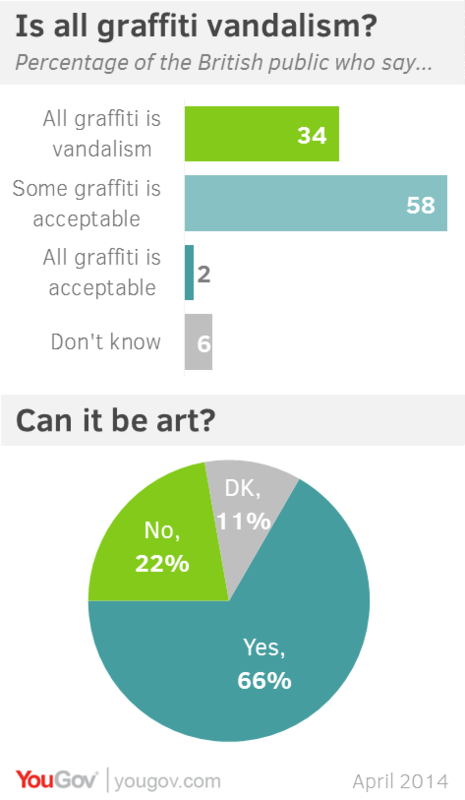 In a separate question, only a third (34%) say “all graffiti is vandalism” while the majority (58%) accept that “some graffiti is acceptable”. Both the belief that graffiti can be art, and that it is not always vandalism, are both held by the majorities across all age groups, though younger adults tend to be more accepting. A parallel survey conducted by YouGov America found similar results: 50% of Americans some or all graffiti is acceptable and 69% think it can be considered an artform. Still, not everyone has come round to graffiti in general. Asked generally if they liked or disliked “graffiti”, only 15% of the public say they like it, while 39% dislike it and 42% are neutral. 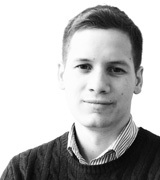 Yet there is a particularly wide age gap here – over 60s are more than twice as likely as 18-24s to dislike graffiti. There are also significant regional differences. People in London, a city that hosts a thriving street art scene and is home to many original Banksy works, are almost split on graffiti (23% like it and 28% dislike it), while people elsewhere in Britain are much more likely to have a negative opinion of it.